If you put the address of Yours Kitayama (AbcdeFlat) into google map, sometimes it is not correct. Please use above map. There are some ways from Kyoto station to Abcdeflat. If you want to come to AbcdeFlat easily, taxi is easiest way. But you have enough time and power, I recommend city bus. You can see many things and you can save money. 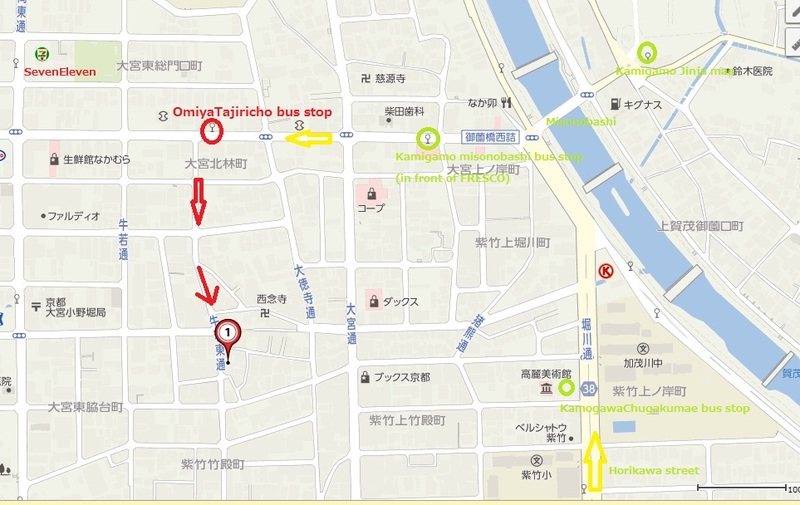 If you come to Abcdeflat by bus, please get on No.9 city bus, and get off at OmiyaTajiricho. I think you had better go to Tourist Information first,and get the bus map(Bus-Navi),and ask to check the bus stop"OmiyaTajiricho" on the bus map,then it is very easy. Kyoto Tourist Information center is on pedestrian walkway in Kyoto station 2nd Floor. 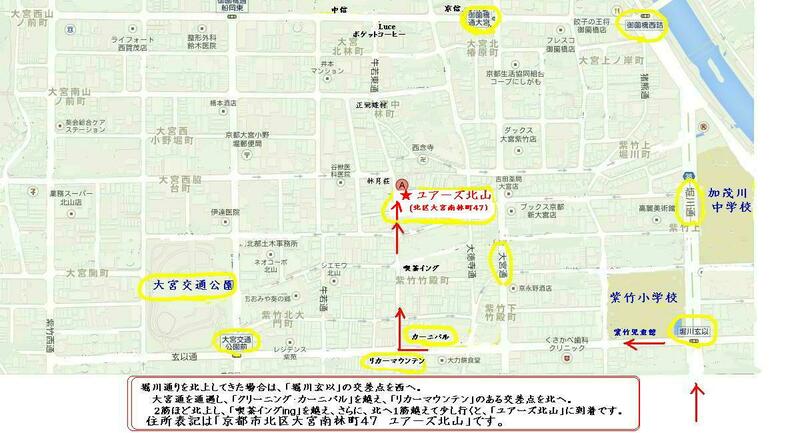 When you get on No.9-city-bus at Kyoto stn, please go to B-area where is in front of Kyoto-stn. It takes about 30-45 minutes from Kyoto-stn to AbcdeFlat by No.9 bus depending on traffic situation. 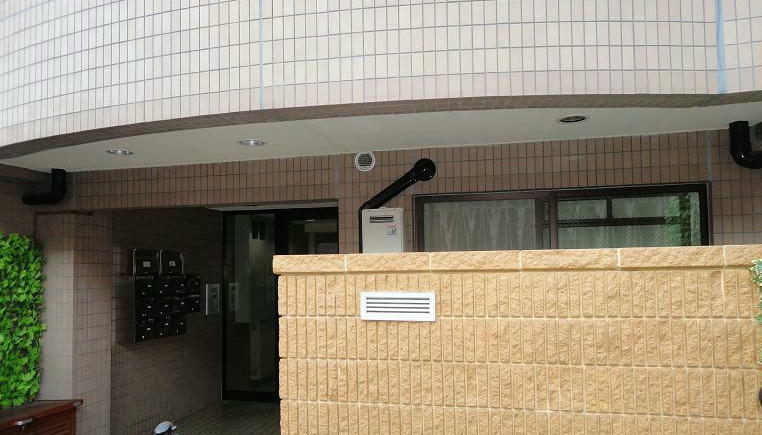 If you want, Usasan can go to bus stop(OmiyaTajiricho) to welcome you on foot. In this case, please send sms to Usasan's mobile phone twice when you get on the bus at Kyoto station and when you pass through KitaojiHorikawa(about 10 minutes before arrival at OmiyaTajiricho). If you can't send sms, please send email when you arrive at Kyoto station and when you get on the bus. And please call me when you arrive at the bus stop(OmiyaTajiricho). Usasan will go to the bus stop by bike quikly. Of course, you can come to Abcdeflat directly. In this case, Usasan will wait for you in Abcdeflat. Taxi is the easiest way. But the taxi driver sometimes doesn't know the exact place. Please make sure where you get off. If the taxi driver doesn't know the exact place, you had better ask a taxi driver to call Usasan to get direction. If you show this map to taxi drivers by smartphone, it may be too small to read. Please print this map in order to be able to read the name of landmarks. And please show it to the taxi driver. If you print small size, taxi driver can not read the address in Japanese. There are the people using the door-to-door home delivery service (takuhaibin) for their luggage. There are two major transport company which have Time Zone Delivery service. AbcdeFlat is a nick name for short term residents. The flat name is "Yours Kitayama".